This scenario was inspired by the Russian attack on a convoy of iron ore sailing from Sweden to Germany described in “After Jutland“, Chapter 6, pages 90-91. The Russian attack group of destroyers has a close cover force of cruisers and a distant cover force of dreadnoughts. The Germans expect the operation and counter with their own cruiser and dreadnought supporting forces. Winds WSW at 5 knots. Sea state 2. Visibility 6 NM. Convoy escorts (one armed merchant cruiser and two groups of trawlers) attempt to distract the attacking Russian destroyers. The convoy makes smoke and heads south at its best speed of 10 knots. The convoy is destroyed. The old German cruisers are losing the fight with the Russian cruisers. 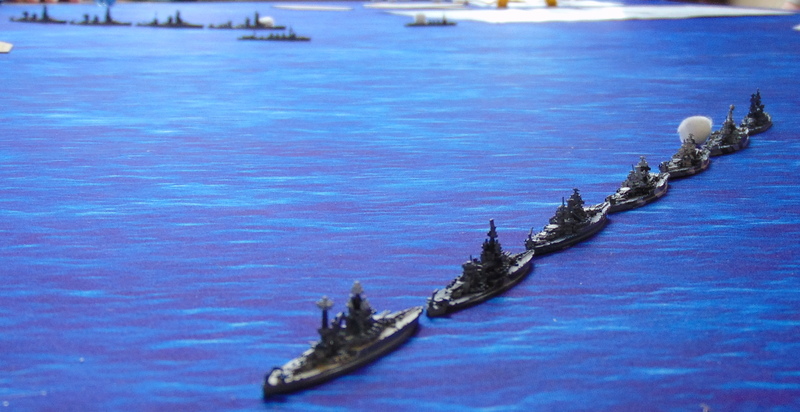 The Russian dreadnoughts press on southwestward to support their cruisers. The German dreadnought divisions deploy into a battleline while the Russian dreadnoughts reverse course and head northeast. Cruisers and destroyers clear the line of fire for the dreadnought action. With the visibility only 12,000 yards the battlelines close to under 10,000 yards. Hits accumulate rapidly. The two lead Russian dreadnoughts are overwhelmed by a fortunate series of hits from four German dreadnoughts. With only two Russian dreadnoughts left to face six relatively intact German dreadnoughts, we called the game. The convoy and most of the German cruisers had been destroyed, but the loss of the Russians dreadnoughts was a high price to pay for meeting the mission objective. This is a Dutch dreadnought design from 1913, modeled in 1/6000 scale. Various designs were proposed from 1912 through 1914, as described in Warship International No. 4, 1988, No. 1, 1989 and No. 4, 1989. The 1913 quadruple turret design was chosen because it differed the most from contemporary German designs. The names were taken from late 19th Century Dutch cruisers. These are various ship designs from WW1 or shortly thereafter, modeled in 1/6000 scale. Many had little or no chance of being built. La Motte-Picquet class French cruiser. 1917 Russian design for a Black Sea Battleship. The link has several 16-inch gun designs. Version 2 of the four variations by V.P. Kostenko (at the bottom of the page) was modeled since it was among the later designs (1917) and matches the drawings provided. Austro-Hungarian Project V Battleship. Austro-Hungarian Project VI Battlecruiser. The last Austro-Hungarian battleship and battlecruiser designs were modeled. German Post-Jutland Battleship Design Studies. Battleship study L20eɑ was modeled since it was selected on 11 September 1918 as the basis for the next German battleship (Dodson, “The Kaiser’s Battlefleet” page 126). Battlecruiser study GK4541 was modeled since it was among the last designs considered (Dodson, “The Kaiser’s Battlefleet” page 127) and since it was included in the Avalanche Press game “Jutland 1919“. Tillman Battleships. Design IV-2 was modeled since it was the one presented to Congress early in 1917. Left: 1917 Russian Black Sea battleship Version 2. Right: La Motte-Picquet class French cruiser. Left: Austro-Hungarian Project V battleship. Right: Austro-Hungarian Project VI battlecruiser. Left: German battleship study L20eɑ. Right: German battlecruiser study GK4541. This alternate history scenario was a confrontation between British and French ships in November 1914. The British were tasked with preventing the return of the French fleet from Oran to Toulon. The French were to get underway from the anchorage at Oran and get past the British. All ships except the rear French battleships have been sighted. The British battleline of the four oldest dreadnoughts and eight pre-dreadnoughts. The French have deployed into a line with the armoured cruisers leading and the new dreadnoughts in the rear. French DDs attack unsupported and are shattered by the fire of British 4 and 6 inch guns. The Devonshire should not be in a camouflage paint scheme in 1914. The British dreadnought division passes through the French fleet. One collision occurs. The Bellerophon blows up and the Temeraire sinks. We stopped play after 12 turns (60 minutes of game time) and about 4 hours of real time. This Friday we played a fictitious naval battle set in the North Sea in 1916. The British attempt to sweep the Heligoland Bight to eliminate German patrols. The Germans are supporting their light forces with heavy ships. The scenario includes ships not actually available in the North Sea at the time. Winds WSW at 3 knots. Sea state 2. Visibility 5 NM toward the SW, 6 NM toward the NE. Initially only the 3rd British BCS and its CL screen enter the Bight. When German BCs are engaged, the remaining British forces move in from the north. We played for about 4 hours without a decisive result. The British had suffered somewhat more damage. In spite of a lot of torpedo fire from the light cruisers and destroyers, the only two torpedo hits were achieved by the Von der Tann and the Blucher. 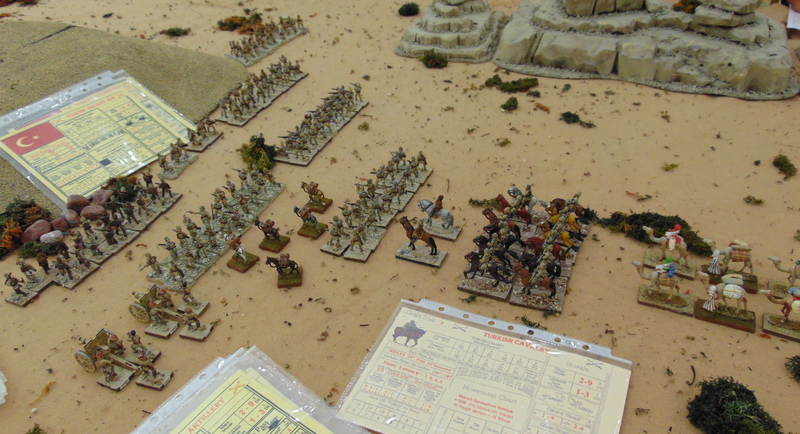 This weekend the local HMGS-South group played a Sudan game using The Sword and the Flame colonial rules (20th Anniversary Edition) and the Gunboats and Dhows rules. Six players and a referee fought on the Nile and beside it. 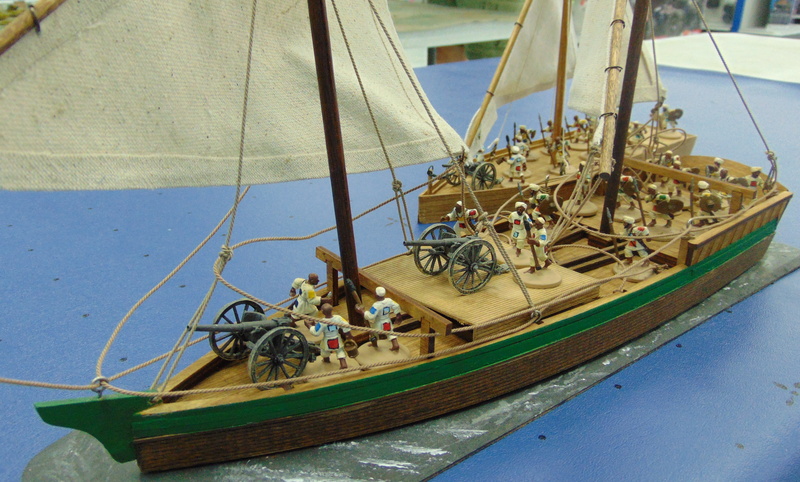 The British/Egyptian force was victorious, sinking both dhows and maintaining control of their base. The boats used were made by Last Stand Dan. Photos and comments are in this Flickr album. Today the local HMGS-South group played a game of Talon. The Terran forces were tasked with defending the planet Eden from a Talon fleet. 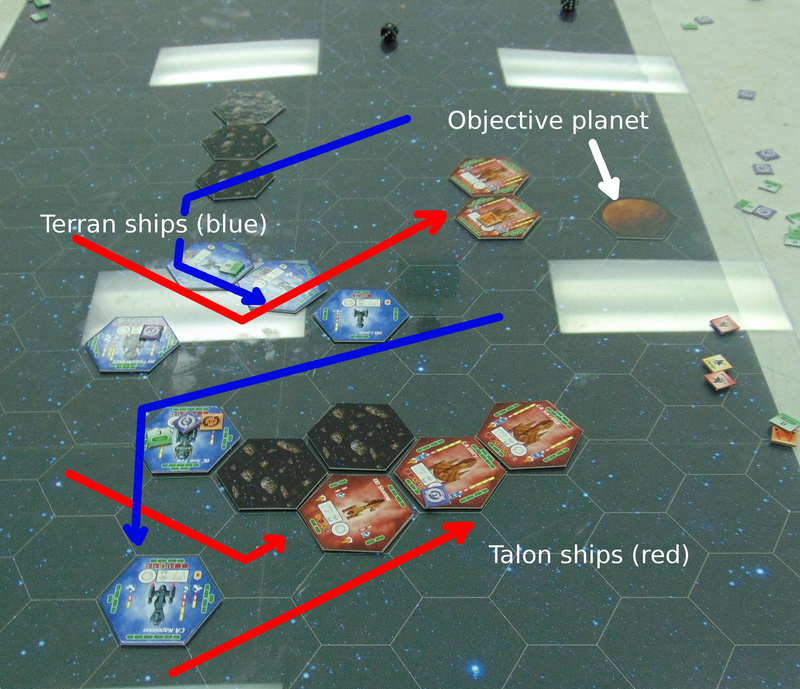 Six players controlled 13 ships (6 Terran, 7 Talon). After 3.5 hours of play, the Talons had done more than half of the damage to Eden required for victory. Given the long reload times of the weapons we decided against trying to finish.